SpaceX Has completed its first mission to the International Space Station with a Falcon 9 first stage and a Dragon 1 resupply vehicle which have both previously flown. The launch took place at 15:36 GMT (10:36 EST) on Friday, from Space Launch Complex 40 at Cape Canaveral Air Force Station. As well as being the first time a previously used Falcon 9 first stage and Dragon capsule have flown together, the launch also marked the first from SLC-40 since a pre-launch explosion of a Falcon 9 rocket in September 2016, which completely destroyed the rocket and its Israeli payload, and severely damaged the launch facilities. Three minutes after the launch, the first and second stages of the Falcon 9 separated, the latter continuing towards orbit while the former performed its “boost-back” manoeuvre, and completed a safe return to Earth and a vertical landing at SpaceX’s Landing Complex 1 at Canaveral Air Force Station. The landing marked the 20th successful recovery of the Falcon 9 first stage – with 14 of those recoveries occurring in 2017. 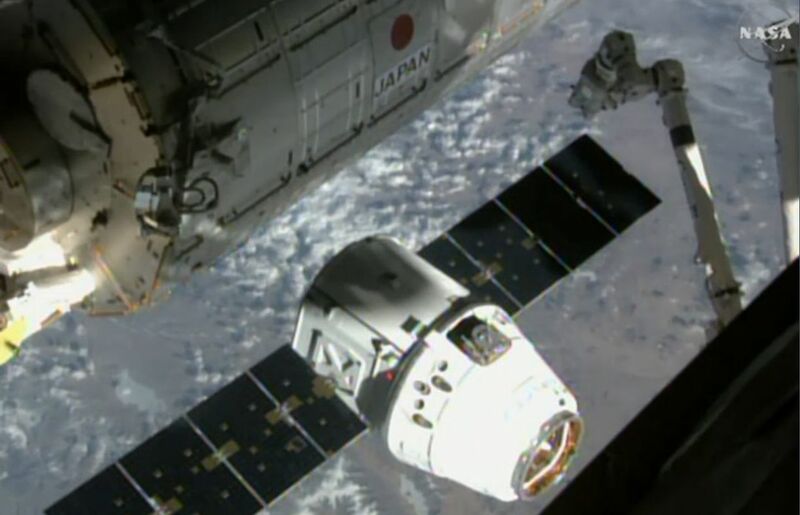 The Dragon capsule, carrying some 2.2 tonnes of supplies for the ISS, was first used in a resupply mission in April 2015. In its current mission, it reached the station on Sunday, December 17th, where it was captured by the station’s robotic arm and moved to a safe docking at one of the ISS’s adaptors where unloading of supplies will take place. The capsule will remain at the station through January, allowing science experiments, waste and equipment to be loaded aboard, ready for a return to Earth and splashdown in the Pacific ocean, where a joint NASA / SpaceX operation will recover it. 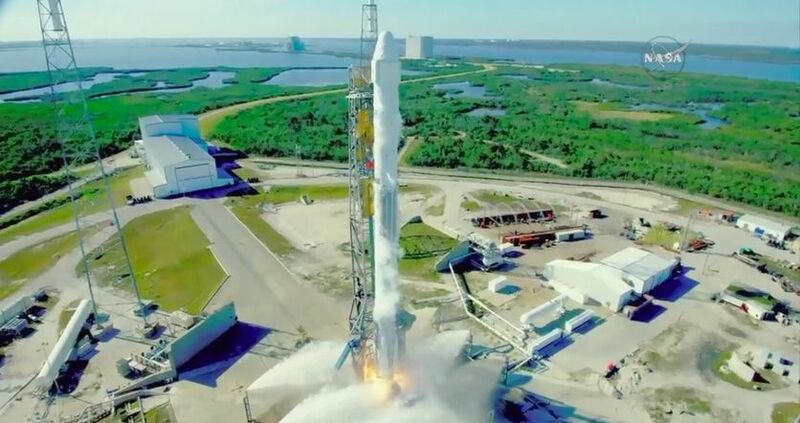 The mission is a significant milestone for SpaceX, bringing the company a step closer to it goal of developing a fully reusable booster launch system. Thus far the company has successfully demonstrated the routine launch, recovery and reuse of the Dragon 1 capsule and the Falcon 9 first stage. On March 30th, 2017, as part of the SES-10 mission, SpaceX performed the first controlled landing of the payload fairing, using thrusters to properly orient the fairing during atmospheric re-entry and a steerable parachute to achieve an intact splashdown. This fairing might be re-flown in 2018. That “just” leaves the Falcon 9 upper stage, the recovery of which would make the system 80% reusable. However, recovering the second stage is a harder proposition for SpaceX – at one point the company had all but abandoned plans to develop a reusable stage, but in March 2017, CEO Elon Musk indicated they are once again working towards that goal – although primary focus is on getting the crew-carrying Dragon 2 ready to start operations ferrying crews to and from the ISS. 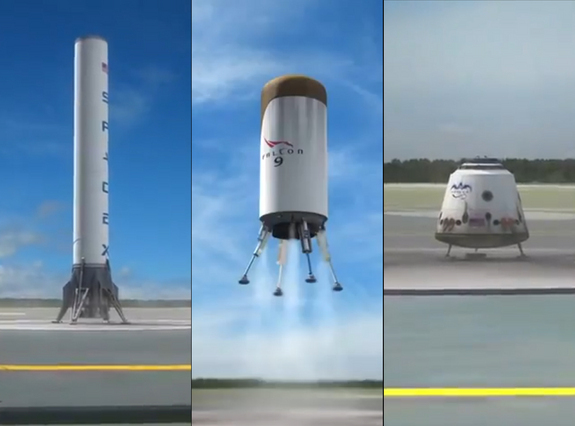 The major issues in recovering the system’s second stage are speed and re-entry. The second stage will be travelling much faster than the first stage, and will have to endure a harsher period of re-entry into the Earth’s denser atmosphere. This means the stage will require heat shielding and a means to protect the exposed rocket motor, as well as the propulsion, guidance and landing capabilities required for a full recovery. The problem here is that of mass. The nature of rocket staging means that – very approximately, every two kilos of rocket mass on the first stage reduces the payload capability by around half a kilogramme. With a second stage unit, this can drop to a 1:1 ratio. So, all the extra mass of the re-entry / recovery systems can reduce the total payload mass, making the entire recovery aspect of a Falcon 9 second stage both complex and of questionable value, given the possible reduction in payload capability. However, with the Falcon Heavy due to enter service in 2018, a reusable second stage system does potentially have merit, as the combined first stages of the system can do more of the raw shunt work needed to get the upper stage and its payload up to orbit. Red Dwarf stars are currently the most common class (M-type) of star to be found to have one or more planets orbiting them. Many of these worlds appear to lie within their parent’s habitable zone, and while that doesn’t guarantee they will support life, it does obviously raise a lot of questions around the potential habitability of such worlds. There tend to be a couple of things which often run against such planets when it comes to their ability to support life. The first is that often, they are tidally locked with their parent star, always keeping the same face towards it. This creates extremes of temperature between the two side of the planet, which might as a result drive extreme atmospheric storm conditions. The second is – as I’ve noted in past Space Sunday articles – red dwarf stars tend to be extremely violent in nature. Their internal action is entirely convective, making them unstable and subject to powerful solar flares, generating high levels of radiation in the ultraviolet and infra-red wavelengths. Not only can these outbursts leave planets close to them subject to high levels of radiation, they can cause the star to have a violent solar wind which could, over time, literally rip any atmosphere which might otherwise form away from a planet. This latter point means that one of the most vexing questions for those studying exoplanets is how long might such worlds retain their atmospheres? In an attempt to answer to that question, planetary astronomers have turned to a planet far closer to us than any exoplanet: Mars.